So Dr. C kept mentioning some really expensive steak made from Kobe beef and that trying it was a must. I was skeptical but after my bad experiences with food, and with steak being my 4th favorite food, I said “why not?” So while in Osaka, we went over to this steakhouse near the hotel. The steak was really expensive: with, or without the meal. It’s the most expensive meal I’ve ever bought. It cost #$%@ Yen! It came with soup, a salad, rice, and a small glass of red wine. It was topped with onions, scallops, and fries, and while cooking it, the chef poured wine on it. It was scary to see the flames rise to at least 3-4 feet in the air as he poured the wine on it. It was placed on a metal skillet-like plate and continued to cook ever after he served it, which was fine for me because I usually don’t eat steak that isn’t well done. The meal itself is hands down the best meal I’ve had since I’ve come to Japan. 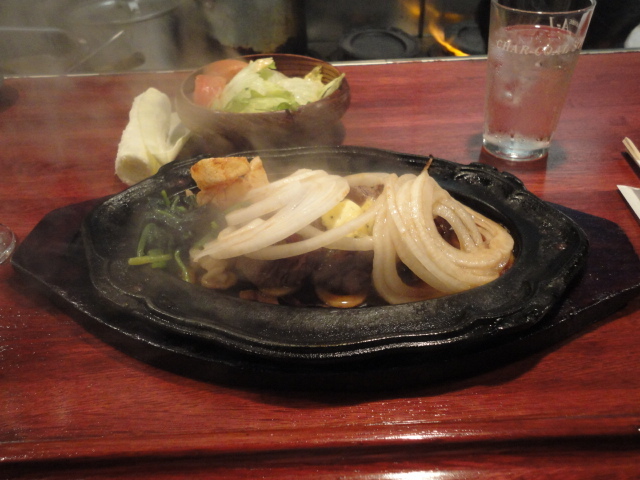 It was really tender and juicy and even the toppings were delicious. I normally don’t eat onions, but the onions placed on top tasted great, probably because of the wine and the juices from the steak they absorbed. The soup served with it consisted of beef and potatoes and was excellent, an so was the rice. The salad was good, but as I’m not big on vegetables, especially salad, I barely touched it. It was disappointed after I finished the steak and wish I had gotten the large instead of a small. But overall, it was worth the #$%@ Yen I paid for it and I don’t regret buying it!